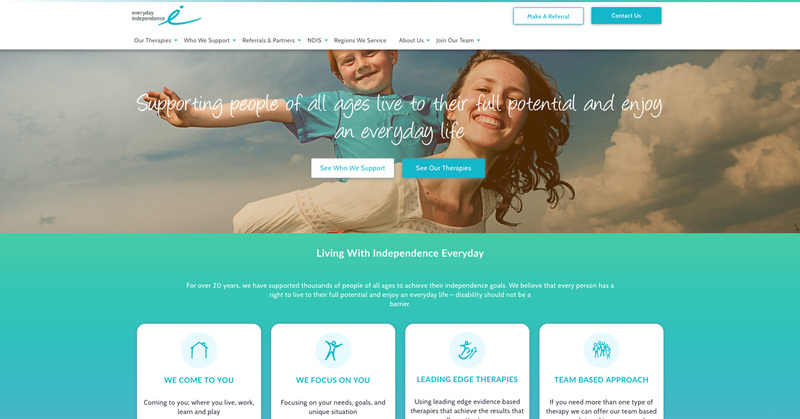 Today Everyday Independence launches our new website. We are excited about this new site as it better reflects our organisation and provides more comprehensive information to the people we support and work with. This new site will provide easy to understand information about our therapy services and our approach to supporting people to live to their full potential and enjoy an everyday life. People living with disabilities and their families will be able to access information about our therapy services and what to expect in their therapy sessions. They will be able to get information about supports for their particular needs and their age group. If you’ve not used occupational therapy, physiotherapy or speech pathology before you can learn more about different therapy types and get some helpful advice about assessing what is and isn’t currently working for you in your life and setting goals that therapy can support you in achieving. Our referral partners will have access to more detailed information about our therapy services and can use a simple online form to make enquiries or referrals. A dedicated section for parents and carers of those with a disability and includes information about parents’ role in therapy and helpful links to supports for parents.